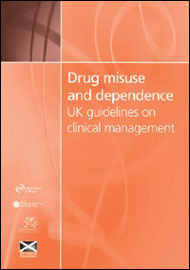 Many in the drugs field will have heard of the ‘Orange Guidelines’, for those of you who haven’t these are the ‘Drug misuse and dependence: UK guidelines on clinical management’. The document provides guidance to those working in the drugs field on best practice when it comes to treatment. They are not perfect. I would like to see much more on diamorphine prescribing, the dispensing of naxolone and the introduction of drug consumption rooms. So you would think when Public Health England (PHE) announced their review of the guidelines in July 2014 we at Release would have welcomed the opportunity to try and get the things we would like to see into the review. That was not the position we took. In 2010 the Coalition Government launched its drug strategy, ‘Reducing demand, restricting supply, building recovery: supporting people to live a drug-free life'. Since then the drug treatment has been bombarded with ‘recovery’ rhetoric. This would be fine if recovery had an all-encompassing approach and included those on long term methadone prescriptions who lead healthy lives, as well those who are abstinent. Instead, what we saw was the emergence of a recovery system that focussed on ‘drug free outcomes’ as the only valid evidence of good treatment and ignored, or at least downplayed, the fact that opiate substitute prescribing (OST) has a positive role to play for many and saves lives. Much of this rhetoric has been borne out of a political ideology which chooses to take a moralistic view towards drug use rather than one based on good practice and sound evidence. Nowhere was this more apparent than the awful 2012 publication ‘Putting Full Recovery First’, a document that had been described as not being Government approved but nonetheless has the stamps of six Government departments on it (and is still available on the Government’s website). This document makes assertions such as ‘it is self-evident that the best protection against blood borne viruses is full recovery” and describes recovery as “full independence from any chemical” (well that is the coffee break gone!). Release does not support the call for the guidelines to be opened for a review at this time. The reason for this is that we are concerned that in the current environment the review process and the final reviewed guidelines could be politicized. The political environment has seen the issue of drug treatment polarised, with some policy makers and Government representatives pursuing an abstinence focused treatment system at the expense of evidenced harm reduction interventions. Release supports a treatment system that offers all options but that the decision as to what is the best treatment for an individual is one taken by that person and their clinician, and not one that is driven by political imperative and ideology. To put this into context, in a straightforward numerical comparison, the Orange Guidelines of 2007, a 132 page document, referred to the term ‘harm reduction’ 8 times and ‘recovery’ once in the mutual self-aid section, the document itself is concerned with treatment interventions and good practice, setting out a framework where patients and clinicians work towards achieving an optimal treatment outcome. In stark contrast, ‘Medications in recovery: Re-orientating drug dependence treatment’ published in 2012, a 32 page document, refers to ‘harm reduction’ on 5 occasions whilst the term ‘recovery’ is referenced over 300 times. Whilst clearly Professor Strang and many of those involved in developing the 2012 document worked hard to ensure that there was good evidence based practice advocated throughout the paper, which there is, nevertheless, it seems as if every recommendation and explanation had to be explained through the ‘recovery’ rhetoric. It is also of concern to note that prior to this consultation, which was launched on 2 July 2014, the Minister of State responsible for drugs wrote to the Advisory Council on the Misuse of Drugs on 4 June 2014 asking ‘whether the evidence supports the case for time-limiting opioid substitute therapy’. This request was borne out of discussions at the Inter-Ministerial Group on Drugs which expressed ‘concern’ that maintaining people on OST for longer than ‘necessary or desirable’ could undermine treatment gains. There is no evidence to support time limited prescribing and in fact, this could put those who are accessing treatment services at significant risk or could create a barrier to treatment. Through the services we provide at Release we have seen more and more punitive measures imposed on people in treatment, and whilst this is not the case in all areas, we are seeing a postcode lottery with some services moving away from a compassionate supportive treatment environment to one which is increasingly punitive. · people being moved from weekly pick up of methadone to daily supervision regardless of the circumstances and in contravention of NICE advice. This is all occurring, despite the recommendations of the Guidelines and ‘Medications in Recovery’ however these documents allow us to advocate on behalf of people and remind services of good practice and their duty towards those who are in their care. If the Orange Guidelines become steeped in recovery focused language we are concerned this would hinder the ability to advocate for good practice. At the same time we are seeing an increase in drug related deaths, with a 32% increase in heroin/ morphine deaths in the last year (read Basak Tas’ excellent blog on this issue). It is for these reasons that Release has said no to a review, the guidelines are sufficient for the moment, and opening them up for review is likely to result in greater losses than gains. Release’s full submission can be read here.